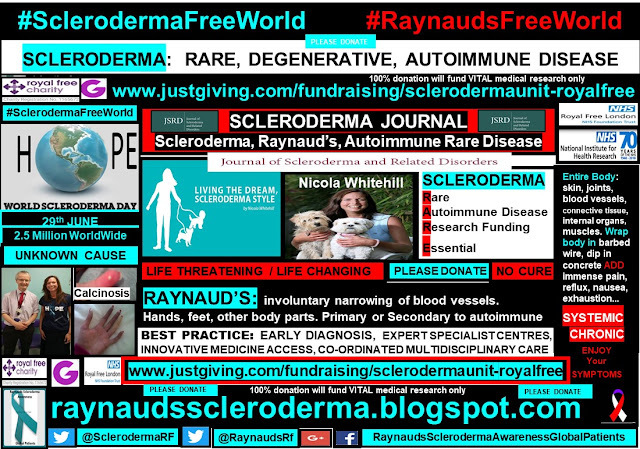 Emerging Strategies for the Treatment of Systemic Sclerosis. 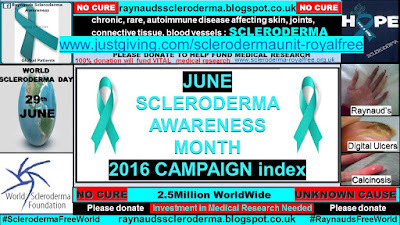 Journal of Scleroderma and Related Disorders Volume 1 Number 2 May - August 2016. 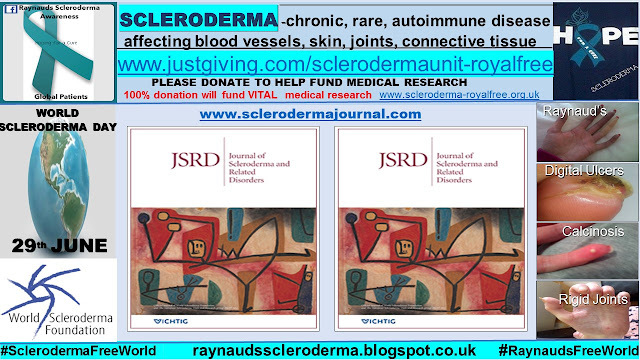 Emerging Strategies for the Treatment of Systemic Sclerosis. 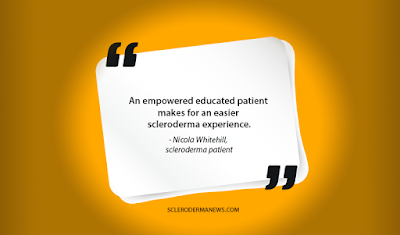 Journal of Scleroderma and Related Disorders. 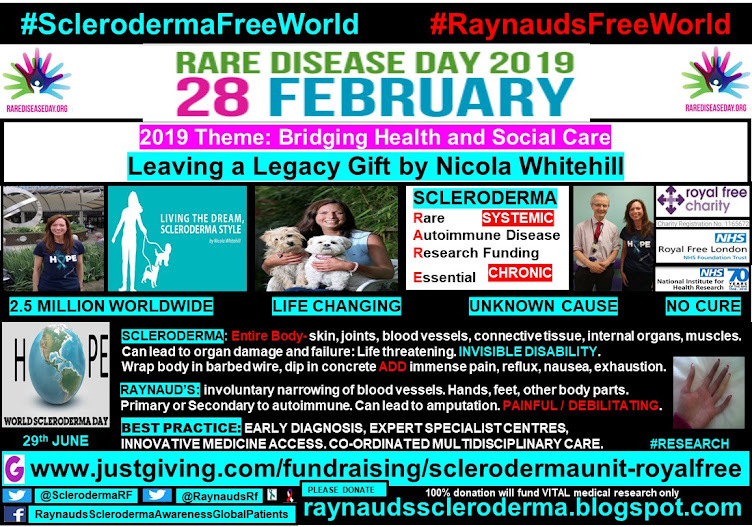 Living with a chronic, progressive, degenerative disease, to which there is currently no cure, makes you discover inner strength which you did not know you had. As Bob Marley sang ‘You do not know how strong you are, until you have to be’. 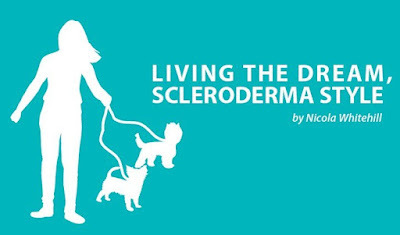 Not only does a scleroderma diagnosis bring along a multitude of debilitating life hijacking symptoms, this is combined with the current reality that there is no cure available or known. 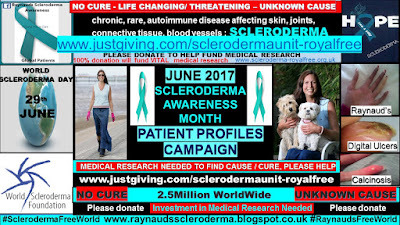 Pharmaceutical agents used for treating scleroderma target symptom suppression as opposed to treating or acting on the underlying cause. 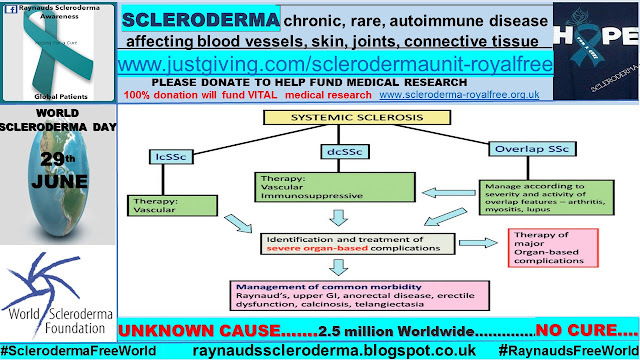 Which, also, currently remains a mystery on the scleroderma, systemic sclerosis pathway. 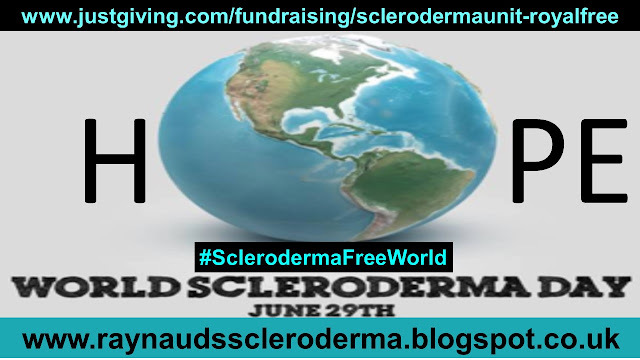 In essence, in my view, an investment in global medical research is essential for the scleroderma patient. The time it takes for newer biologic innovative medicines to reach the market place needs to be reduced. As does, the time taken to access innovative medicines shown to have an improvement in disease progression and severity. 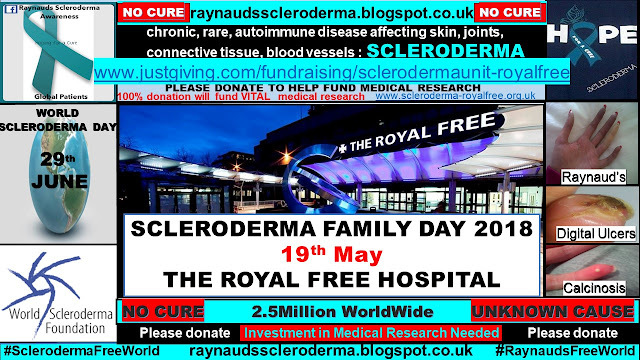 I am grateful that I am still around to be a scleroderma patient in the hope that investment and commitment to accelerate medical research, will instigate a light bulb moment needed for a ‘scleroderma free world’. 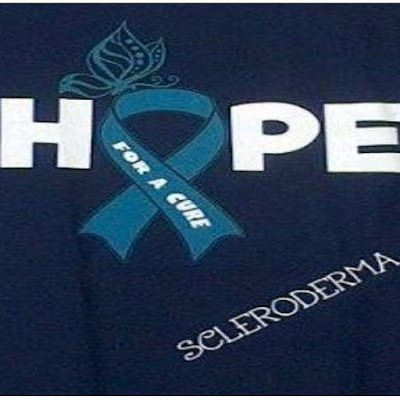 The authors, Dr Dinesh Khanna, Dr Jorg Distler, Dr Peter Sandner and Dr Oliver Distler discuss the current medical understanding of the scleroderma disease process along with possible biologic pathways responsive to newer drug compounds and their mode of action. 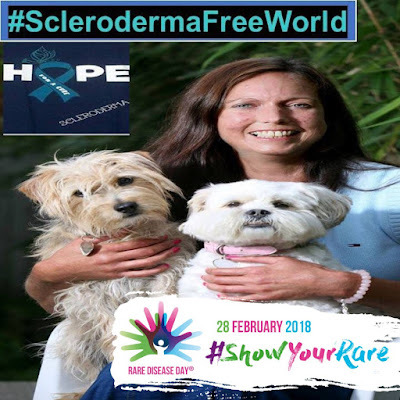 Pathological features of SSc include microvascular damage, dysregulation of adaptive and innate immunity, and fibrosis that can involve the skin, heart, lungs, kidneys, gastrointestinal tract and other organs. The rate of progression and extent of organ fibrosis are the primary determinants of clinical outcome….. 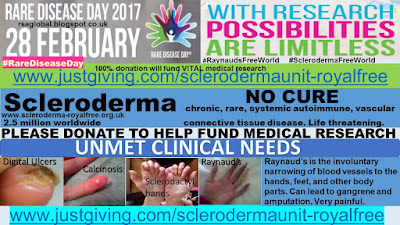 Currently, there are no treatments that modify the underlying cause(s) of SSc, in part because those causes are incompletely understood. 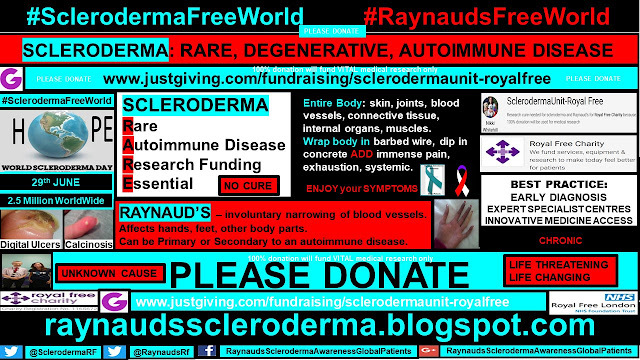 Thus, current therapies generally target disease complications, including organ involvement. 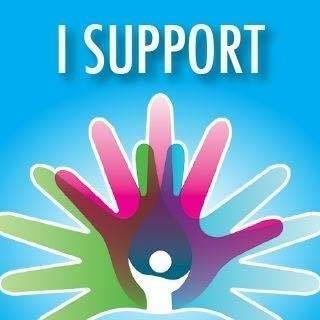 Early diagnosis of SSc, and assessment and treatment of organ involvement, are critical aspects of patient management because organ involvement is responsible for most of the complications and mortality in SSc….. The Paper estimates a prevalence of 300-500 cases per million adults in the US, with another population-based sample in Canada consistent with his estimate, 443 cases per million. This is thought to vary in the EU, 31-88cases per million in England, to 158, 154, and 277 cases per million in France, Greece and Spain respectively. Higher incidence in women than men (ratios of 4.6 to 5.7:1). There is also evidence for difference in prevalence across racial and ethnic groups, with rates slightly higher among blacks than whites, lower among people of Asian ancestry, and higher in some Native American groups. Severity of disease and its course can also vary according to gender and ethnic background. For example, black patients are more likely than white patients to have diffuse cutaneous disease, and black patients have a higher risk of mortality. Even though the prevalence of SSc is lower in men than women, on average male patients with SSc have a worse prognosis and higher disease-specific mortality than female patients. 'Identification of several key pathways in the SSc process have opened potential targets for therapies. These pathways include vascular damage and immune activation, and, the fibrotic pathway. The vascular damage can be seen by reductions in the number of capillaries and narrowing of the vessel lumen leading to impaired blood flow and starving the tissues of oxygen. 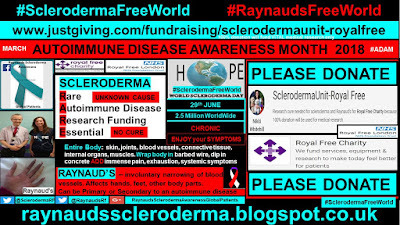 This produces inflammation and overactivation of immune cells, with less inflammation in later disease but persistent activation of the immune system. RITUXIMAB acts on reducing the excessive circulating immune B cells. A recent study reported that it had significantly reduced the modified mRSS compared with matched controls, these patients also showed a less decline in lung function. 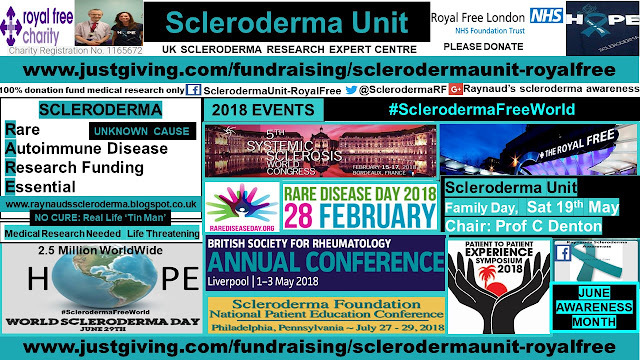 Ongoing trials are exploring the efficacy and safety of rituximab in SSc associated polyarthritis (NCT01748084) and SSc-associated PAH (NCT01086540). 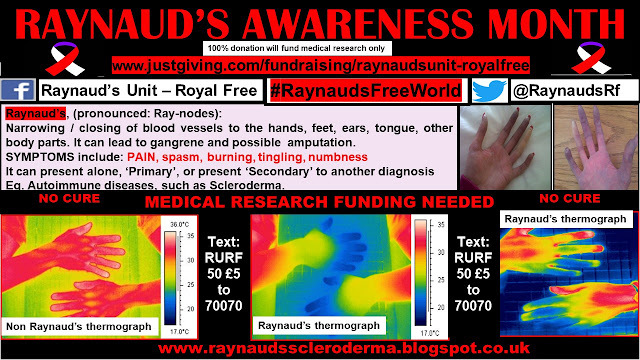 These trials will also provide information about anti-vasculopathic, anti-fibrotic, and immune modulatory effects of rituximab. ABATACEPT acts on immune T cells deactivation. A small study in patients with SSc-related refractory polyarthritis or myopathy found that abatacept significantly improved joint parameters, although there was no change in skin or lung fibrosis. However in another study, abatacept was shown to have significant improvement on Mrss score. These results suggest that it may be possible to identify a subset of dcSSc patients most likely to respond to abatacept. A phase II multicenter international trial is underway to study abatacept in patients with dcSSc; the trial uses skin fibrosis as the primary endpoint (NCT02161406). Evolving understanding of the SSc disease process indicates that vascular and immune activation initiate a fibrotic process that then becomes self-sustaining through several mechanisms. Fibrosis may continue long after evidence of immune activity subsides in affected tissues. Thus, many of the current efforts for developing therapies are focused on interfering with mechanism responsible for unregulated self-sustaining fibrosis. Early studies have shown that skin fibroblasts isolated from patients with SSc continued to produce higher amounts of collagen and other extracellular matrix components compared to those fibroblasts from normal subjects. (TGFβ) has been recognised as a central mediator of fibrotic signalling in SSc. This makes it a natural target for potential antifibrotic therapies in SSc. 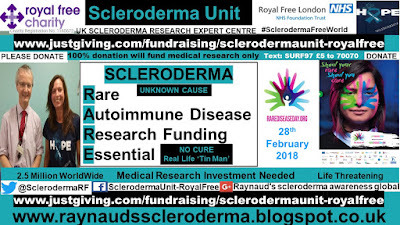 The human antibody metelimumab showed no evidence of a treatment effect, however, fresolimumab has shown a statistically significant decline in mRSs scores within a few weeks after administration of one or two doses. A decline in the expression of the (TGFβ)-regulated genes thrombospondin-1 and cartilage oligomeric protein, as well as significant declines in the infiltration of myofibroblasts into the dermis. This study was too small to effectively evaluate adverse effects, although several patients had bleeding episodes, and anaemia was common. 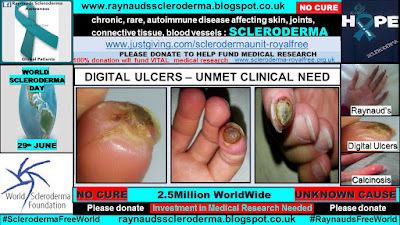 Soluble guanylate cyclase inhibitors such as Riociguat and BAY41-2272 are showing promising results with inhibiting skin fibrosis. Riociguat is currently licensed for Pulmonary Arterial Hypertension with an ongoing phase II multicenter international trial of patients with dcSSc (NCT02283762) underway. Interleukin-6 (IL-6) is produced by B cells, T cells, and fibroblasts, and it promotes inflammation and fibrosis. Serum IL-6 levels are elevated in certain patients with SSc, particularly early dcSSc, and these levels have been suggested to correlate with progression of skin involvement, worsening lung fibrosis, and reduced long term survival. However, where fibrosis is less inflammation dependent, an anti-IL-6 antibody was ineffective. This finding may indicate that strategies targeting IL-6 may be most effective in patients with inflammatory SSc. 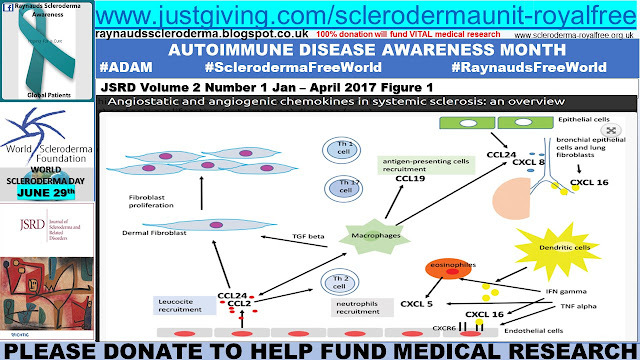 Tocilizumab is an antibody to the IL-6 receptor approved for the treatment of rheumatoid arthritis. Treatment with tocilizumab showed significant improvement in joint parameters as well as improved outcomes with lung resolution. No statistically significant change was seen in skin score. A phase III trial of tocilizumab in SSc is currently recruiting participants (NCT02453256). In addition to (TGFβ), various other growth factors and cytokines are thought to be involved in promoting fibrosis on SSc, such as connective tissue growth factor (CTGF) and the platelet-derived growth factors (PDGFs). Imatinib is a tyrosine kinase inhibitor (TKI) targeting PDGF, c-abl, c-kit, and has been shown to prevent fibrogenesis in the laboratory. So far, the study results show Imatinib to trend toward increased lung capacity and improved skin score, making it a possible benefit in the SSc-ILD population at low doses due to its adverse event profile increasing with dose concentration. Nilotinib is a TKI active against the PDGF receptor as well as c-Abl and other tyrosine kinases. In a small study, skin scores were improved, as well as predictive markers of response were evidenced. Higher baseline levels of expression of genes related to (TGFβ) or PDGF signalling were associated with response and expression of these genes declined during treatment. Nilotinib was associated with abnormalities in liver function tests and QTc prolongation, the latter of which required discontinuation of treatment in two patients. Dasatinib is another multi target TKI approved to treat chronic myelogenous leukemia, however, it showed a high serious adverse event profile in a small scleroderma patient study. Nintedanib is a TKI-targeting fibroblast growth factor (FGF) receptor, PDGF receptor, and vascular endothelial growth factor (VEGF) receptor, as well as Src-family tyrosine kinases. So far, studies are showing promising results with skin and lung fibrosis reduction. A phase III trial of nintedanib with patients with SSc and ILD is ongoing (NCT02597933). Pirfenidone is an anti-fibrotic agent with anti-inflammatory properties including inhibition of pro-inflammatory cytokines and inhibition of inflammatory cell proliferation. a controlled clinical trial in patients with SSc-ILD is planned, further to a safety and tolerability trial results showing dosing tolerability. The peroxisome proliferator-activated receptor-γ (PPAR-γ) is a key suppressor of fibrosis. A genome-wide association study provided evidence for a role of PPAR-γ in susceptibility to SSc and PPAR-γ is downregulated in patients with SSc. However, caution is exercised as the use of PPAR-γ agonists increases cardiovascular event risk. So far, the drug molecule IVA337 has not been associated with this adverse event and is the subject of an ongoing proof-of-concept phase II trial in patients with dcSSc (NCT02503644). Mouse models have shown that by blocking this receptor, fibrosis is reduced. 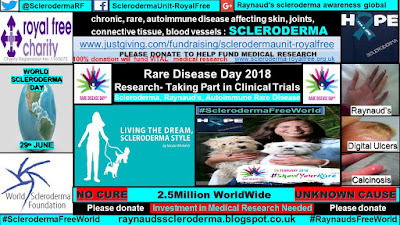 Studies have shown the chemical compound SAR 100842 to reduce expression of fibrosis related genes in SSc skin fibroblasts, with patients treated with SAR100842 showing a decline in skin score. Management of SSc still rests on the treatment of organ specific complications, and no disease-modifying therapies are yet available. 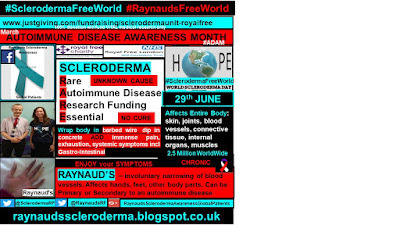 However, recent years have seen major advances in our understanding of the pathophysiologic processes responsible for the immunologic fibrotic mechanisms of disease. This is complemented by development of better outcome measures and data driven approaches to assess for cohort enrichment. Concurrently, studies in large patient cohorts have yielded valuable insights into clinical and laboratory markers of disease activity and prognostic markers of progression, which should serve to identify clinically relevant disease subtypes to refine enrolment criteria for clinical trials. 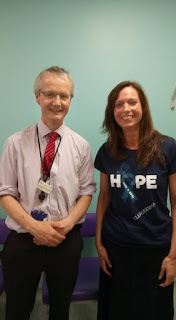 In the meantime, I know that I am fortunate to now be 13 years immunosuppressant and chemotherapy free. 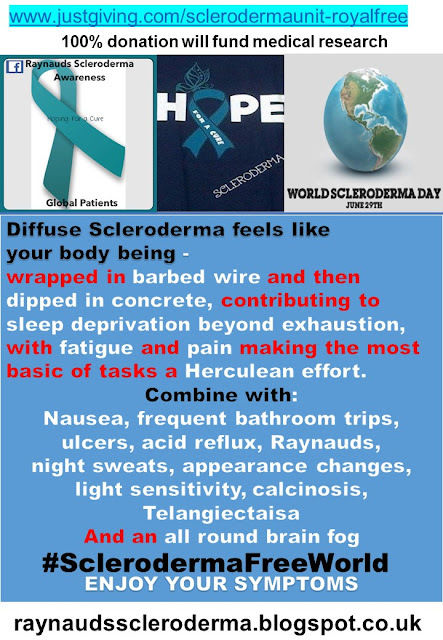 I will continue to “Live the dream, Scleroderma Style,” with hope, remaining as my best friend and companion – I even have the T-shirt.